A place to discover the culture of colonial America is the quaint and beautiful Colonial Williamsburg. The town is a living representation/restoration of the 18th century colonial capital. Almost every house is a museum dedicated to preserving that colonial heritage. If you are a history buff and you love antiques, this is the place for you. Shops and cafes in the downtown area look like museum places but are all functional. In fact, it looks like Patrick Henry or Thomas Jefferson could be that customer at the next table. Money Magazine places Williamsburg #5 on its list of “Best Places to Live." Additionally, Busch Gardens is only a short trip away, and the College of William and Mary offers many scholarly and cultural opportunities. Retirees can choose to live in an antique home in the downtown, or in one of the 55+ or upscale developments nearby. See links at top right for Williamsburg active adult communities. Real estate is very expensive in Williamsburg. According to Zillow the median home value was $302,600, in late 2017. Many homes are available in the $400's. Williamsburg is the rare market where prices have held steady in recent years. Property taxes are low. A lot of Williamsburg’s culture revolves around its colonial setting. History buffs will find everything they need here. 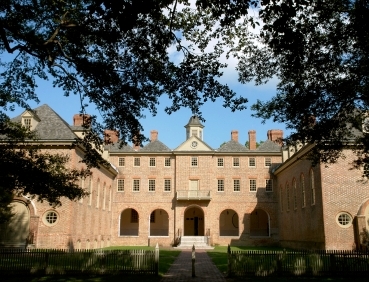 The College of William and Mary has many cultural offerings. The Williamsburg Regional Library is extremely well funded and has more than 281,000 volumes. The Christopher Wren Association offers classes to people of all ages who have a desire to continue academic learning. The classes are sponsored by William and Mary, and over 1,600 people are signed up. Crime rate is very low in Williamsburg. There are at least 2 hospitals in town, including Sentara Williamsburg Regional Medical Center, a new facility with 145 beds. Eastern State Hospital is another accredited facility. Richmond and Hampton have additional hospitals, including the VA.
Newport News/Williamsburg Airport is about 25 minutes away. Norfolk Airport and Richmond Airports are less than an hour away.